Could Amadine be the Illustrator alternative you're looking for? Adobe Illustrator has had a good run of basically owning the vector market, but increasingly it's having to fight its corner against newcomers that offer equally strong tools at more attractive prices. 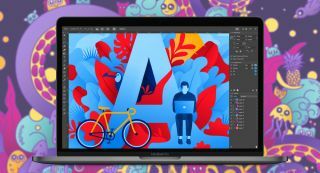 Affinity Designer delivered that vital first shot across Illustrator's bows, and now there's a new contender that could become the go-to choice for anyone wanting to create impressive vector art – at least, as long as they have a Mac. Amadine is a new graphic design tool from Ukraine-based developer BeLight Software. The app is aimed both at design professionals and creative amateurs, and features a set of vector drawing tools put together with user-friendliness and quality results in mind. If you've ever felt overwhelmed by the volume of tools on offer in other vector apps, Amadine is likely to be a welcome alternative; BeLight has created its tool set to give you essential functionality without anything superfluous getting in the way. It features a high-end Pen tool for creating smooth, precise curves, with multiple stroke effects and plenty of modifiers to help you get each line looking exactly the way you want it, as well as a Draw tool that combines the best of a brush and freehand pencil tool. Amadine's Width tool enables you to draw with an intuitive variable stroke without the need to define its width manually, and when it comes to colouring your work it has fills and overlapping gradients with loads of hue options. It also has a set of text tools for that all-important lettering and typography, and for those final touches there are plenty of effects for stylising your work, so you can bring everything to life with inner and outer glows, shadows and blurs. If we've piqued your interest, the good news is that you can give Amadine a test drive right now for free. The beta version was released for Mac last week; BeLight says that it's also working on an iOS version, so keep an eye out for that.